Vastu Shastra says that the main door of any house plays a very important role and is considered to be the face of its inmates and accounts for at least 15-20% of this ancient science. This is because it allows the entry of good or bad luck into the building at all times. Hence, it is imperative to take great care while deciding on the location of the main entry. 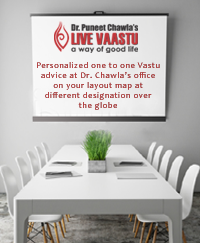 The main door of a house is given upmost importance in Vastu Shastra and by Vastu experts in every nook and corner of the globe. This is because it reflects the first impression, beauty, personality and well being of the occupants. Regarded to be the face of the house, great emphasis is given to its location and direction. As the ‘face’ of the house and the main inlet of positive energies, it is critical to get the entrance right. Since the main door is treated as the face of the house, care should be taken in a manner as we take care of our face each morning. There are two aspects to ensuring the creation of an auspicious main door- one is the direction in which it is located and the other is its general maintenance and upkeep. 1. Placing the main door in any of the eight directions, according to their usage, has its own share of positive and negative effects. However, as a Vastu expert since more than two decades now, I would like to add that the south-west is probably the worst direction for placing the main door. This causes problems and delays in various spheres of your life. This is because the magnetic energy emanating from the north-east should ideally get accumulated in the south-west, but a door in this corner results in it all leaking out. 2. The main door should not only be bigger than the rest of the doors of the house, its dimensions should also be as defined by Vastu Shastra principles. Ideally, its length and breadth ratio should be 1:2. In some buildings, due to the low height of the door is low; while in others, due to shortage, the width of the door is less. This causes problems in energy flows related to opportunities and wealth. back. So, when you place the God with His back to the house, you are, in essence, inviting poverty into the house. 3. Never place pictures of deceased people or your Guru in the mandir. This is because the deceased person or guru was a human being, and as such, have a lower position in comparison to God. 4. Make it a point to light a diya or burn incense before the Gods in your mandir every evening.